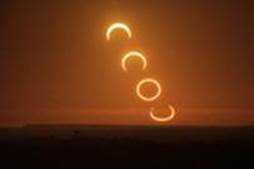 Annular (Ring of Fire) Solar Eclipse – Tuesday, April 29, 2014. Given the intensity we’ve been experiencing these past 10 days (Grand Cross configuration) – the New Moon in Taurus offers welcome relief. Taurus is our most earthy of earth signs and helps us stay grounded. Mercury in Taurus joins the Sun and Moon – emphasizing that now’s the time to take practical steps to “put our house in order” – at home, at work, with family and friends. The Sun and Moon and Mercury in Taurus are in harmony with Jupiter in Cancer and Chiron in Pisces – as earth signs harmonize with water signs. These positive relationships make it easier to focus on hearth and home (Jupiter in Cancer) – taking the time to nurture ourselves and others. Chiron in Pisces brings in spiritual energies – making this a good time to focus on what’s really important in our lives and make time for reflection or meditation or any practice that puts us in touch with our inner being. Another positive aspect during this time is that the Sun, Moon and Mercury are in harmony with Pluto in Capricorn. This brings us strength and courage to take practical steps to move our priorities and plans forward. It’s a good time for mental focus and research (Mercury in harmony with Pluto). With Mars still moving retrograde until May 20 – there may be delays in putting our plans into action. More research may be required and other elements put into place first. New Moons bring the energy of new beginnings – and these Planets in Water and Earth elements make this a softer more nurturing time. Let’s focus on our homes and families and friends and slow down to “catch up with ourselves” after a very intense few weeks. The Earth is our greater home that sustains us – it’s vital that we support her health for the benefit of all living beings. Special Spring Offerings – New Moon. April 29 – Full Moon May 14. (*) These readings are done for parents to help them better understand their children – I also include some information about the family constellation. Program 7: The Grand Cross – The Grand Cross Experience – Part II: We’re all in this Together. This program was recorded April 23, 2014 – I hope you enjoy it and appreciate any feedback. Cosmic Know-How will next be heard live on May 7, 2014 – 2:30 EST (11:30 am PST and 1:30 pm CST). Each program will be archived here within 1-2 day after the live broadcast. Program 8 Wednesday April 23 at 11:30 am PDT (1:30 pm CDT or 2:30 pm EDT). This Week’s Topic: The Grand Cross Experience – Part II: We’re all in this Together. Please call in (310) 928-7733 or text innerlightradio@yahoo.com with your birth information and any questions you may have ! I encourage you to call or email me ahead of the show and I’ll answer your questions on the air. Our Astrological New Year began on March 30 – with strong Aries energies – setting the tone for the build-up of intensity during the rest of April. This Full MOON is in the sign Libra emphasising the need for partnering/cooperating with others. The SUN (Opposite the Full MOON) is in the sign of Aries – indicating more concern with self-interest and taking action – rather than waiting for agreements. Total ECLIPSE of the MOON – April 14. Adding to this – at the time of Full Moon, we will have a Powerful Full Moon Eclipse (some people call it the “Blood Moon”). When the Moon is eclipsed – emotional responses, personal values, and priorities take a back seat to practicalities and actions in the world. This can be very very frustrating. Just prior to this Eclipse, the Moon will be next to Mars in Libra, adding more emotional fuel to the Grand Cross. So, buckle up! We’re in for quite a ride. Getting “carried away” by negative emotions will just make things worse. It’s important to take several times each day (5 minutes will do) to slow down, stay present and grounded. Remember – in this atmosphere – we’re all subject to emotional tensions that may erupt for no particular reason. Kindness to ourselves and other goes a long way. The rare Grand Cross occurring exactly on April 21, is in Cardinal (action) signs. In this configuration, Mars in Libra will be opposite Uranus in Aries – setting the stage for maximizing tension between what “I” want and what “we” can agree to. This tension can result in impatience and jumping into action without consultation. The other polarity pair in the Grand Cross is Pluto in Capricorn opposite Jupiter in Cancer. Pluto in Capricorn, signifies the breakdown of systems that have weak foundations, eg, political, economic and other important social systems. Personally – Pluto brings our attention to our negative patterns and assumptions. Jupiter in Cancer magnifies all these energies and brings in issues regarding safety and security. We are already well within this field and it can feel quite unsettling. We will be experiencing the effects of this Grand Cross for weeks afterward as the Planets separate. Pay special attention to times when your buttons will get pushed – catch yourself and shift your energy. Stay alert and be quick to apologize. Ask yourself – is it better to be right or is it better to be loving? On April 29, when the Sun is eclipsed – emotions can reign and reason takes a back seat. This can also be very frustrating! Obviously, the last two weeks in April can be major turning points for nations as well as communities and individuals. What to do? First, let’s be aware that everyone may be feeling reactive and “touchy.” It’s best to keep coming back to centre, staying grounded and realizing that we’re all in this together. If we get angry – best to step back and decelerate our reactivity. This is a time of testing our ability to be compassionate and patient with ourselves and our families, colleagues and communities. The Amazing Grand Cross energies foster creativity, originality and “thinking outside of the box.” On individual and collective levels, creative energies surge forward – brilliant solutions may come forth in technology, the arts and sciences. With Mercury in Aries until April 24, our mental processes quicken – again it’s important to think before we speak – especially if we’re feeling very emotional. Meanwhile, VENUS, Planet of creativity and loving relationship – is floating through the sign of Pisces until May 2014. She glides past Neptune from April 12 – 14 – bringing gentleness, appreciation of beauty and music – connecting us with our spiritual natures. Venus then moves close to Chiron from April 16-21. Chiron is an asteroid orbiting between Saturn (material world) and Uranus (metaphysical world). Through Chiron’s presence, we experience our connectivity between spirit and body and between ourselves and the Earth. This much subtler and more mellow energy combination may not have the intensity of the Grand Cross. Still – these refined and loving energies are available to us when we check inside, take a few deep breaths and focus on gratitude. Understanding our birth charts helps to clarify the nature of our struggles and the nature of our gifts . What are our strengths and where do we get stuck? What are the timings for each planetary cycle? Deeper self-knowledge is vital for developing acceptance and compassion for ourselves and others. Astrology helps us remember that the challenges we face are cyclical – and it highlights opportunities where we can learn and grow. It’s full of practical, useful knowledge that we can immediately apply to our lives. I’m thrilled to announce my new Internet radio program – on the well-established Inner Light Radio Network. It airs on the 1st and 3rd Wednesdays of each month at 2:30 pm EST (1:30 pm CST and 11:30 am PST). I encourage you to call in while the program is airing (310) 928-7733 to ask any questions you may have. You may also submit questions via email at innerlightradio@yahoo.com. Please call or contact me with any questions you may have that I can answer on the air. Program 7: The Grand Cross – PART I – What can this major upcoming Astrological event mean in our lives? How do we prepare for it? This program was recorded April 2, 2014 – I hope you enjoy it and appreciate any feedback. Cosmic Know-How will next be heard live on April 16, 2014 – 2:30 EST (11:30 am PST and 1:30 pm CST).